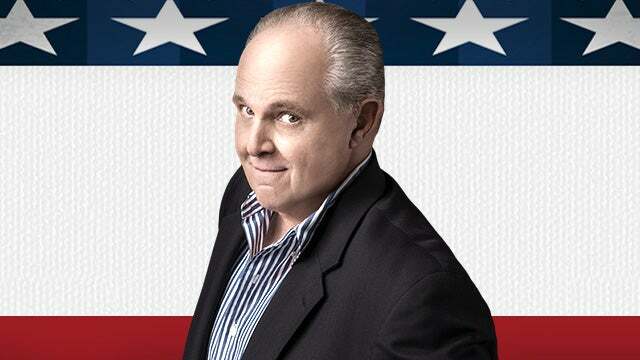 RUSH: Now, I want to get to this Millennial survey. This comes from StudyFinds.org, and it’s a fairly frequent survey that’s done from generation to generation. And I just want to remind you, folks — and I got in a lot of trouble for this the first time I proffered this theory. You know, I was talking to somebody about the Greatest Generation, the World War II generation and what they went through and how quickly they had to grow up and the many threats to the literal existence of the United States that they had to defeat. They had to grow up and realize at age 16 to 18 that there were things much larger than themselves. They answered the call. They had to deal with the Soviet Union claiming to bury their grandkids. They had to deal with World War II. Many of them lived through the Great Depression. They had real stress. The children of the Baby Boom generation, I think, had it relatively easy by comparison. And I spent about a half hour explaining all this, and I ended up by saying I think the Baby Boom generation and subsequent generations have had to invent their own traumas. Myself in that generation included. I’m a Baby Boomer. We had to invent our own traumas to tell ourselves that we had really tough times — really, really challenging times, lots and lots of adversity that we had to overcome. But my theory is we haven’t had anything of the sort compared to the World War II generation, although I do think that the generations today (without knowing it) are facing similar threats as this nation faced in World War II. The difference is these threats are internal as well as external. So given all that, I want to share with you a survey of 2,000 American Millennials. I want to share with you the Top 20 Most Stressful Things According to Millennials. Are you ready? “Number 1: Losing wallet/credit card.” That is the most stressful thing, the thought of losing it. “Number 2: Arguing with partner.” Number 3 is traffic delays and the daily commute. Okay. 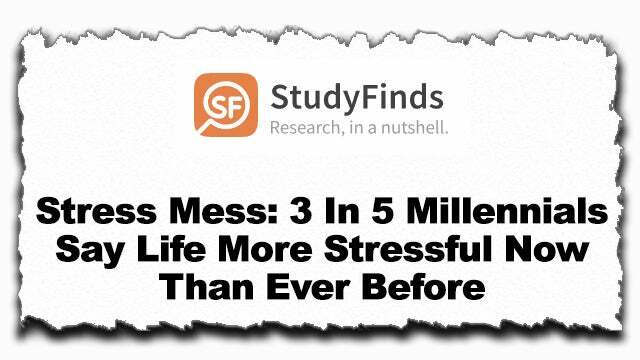 So we’re at the top three most stressful things to Millennials. Losing the wallet, arguing with partner, and the daily “commute/traffic delays.” “Number 4: Losing phone.” Number 5 top 20 most stressful events to Millennials: “Arriving late to work. The 14th most stressful thing to Millennials: their “phone screen breaking.” Number 15 most stressful thing: “Credit card bills.” Number 16: “Check engine light coming on” the dashboard. Number 17th most stressful thing to Millennial: “School loan payments.” Number 18: “Job security.” Number 19: “Choosing what to wear every day,” and number 20: “Washing dishes.” Now, you want to tell me that I’m wrong? I don’t doubt the stress is real. But I’m telling you (Snort! ), by comparison — and I have to be very careful here, because they think this is end-of-the-world stuff, and to them it is. RUSH: To Lake Charles, Louisiana. This is Suzanne. Welcome. Great to have you with us on the EIB Network. Hi. CALLER: Thank you so much, Rush, for having me. I appreciate it. This is the second time I’ve talked to you, and I love it, just listening to you every day. CALLER: I wanted to talk to you about a wedding that I attended last weekend of Millennials. And it was kind of depressing. RUSH: Wait a minute. Where was it? CALLER: It was down in south Louisiana or southeast Texas. RUSH: Wait, wait, wait. There were two grooms? CALLER: No, no, sir. No, sir. It was a groom and a bride. RUSH: So it’s a standard what we all think of as a marriage? RUSH: It was a man and a woman getting married? CALLER: Yes, sir, it was. And it was the exchange of vows. And he’s a sociology major. He’s about to graduate. And what his exchange was with his bride was just so negative, because he just said, “Look, you’re the only thing I have to look forward to. The world is such a negative place.” And I thought of you, because it was like, you were the only thing I have to look forward to. The world is such a horrible place. RUSH: Wait. Now, are you sure the guy wasn’t just sucked up to the bride? CALLER: — that you want. RUSH: Well, wait, no, no. What was the reaction of the crowd? CALLER: It was bland. Because it was a wedding, right? RUSH: How many people were there? CALLER: There were probably about a hundred people there. RUSH: And so the groom is standing up there expressing his love for his bride and he’s obsessed with how rotten things are in the country and in the world? RUSH: Did you know either the bride or groom? CALLER: Yes. I’m related to the groom. RUSH: Did you talk to them afterwards and asked them why they are so pessimistic, apocalyptic, and fatalistic about their country? Why are you getting married if it’s this bad? Did you ask them? RUSH: What did he say? RUSH: We’re running out of time here. What did he say? I’m looking for some meat here. RUSH: Man, oh, man. That is unbelievable. I can’t imagine this — well, I can because I’m sure it happened. I’m just — it’s a sad thing if it’s really representative of what they think. And I don’t doubt it at all, folks. This is the influence that they’ve grown up under. I mean, climate change, the world isn’t gonna be here when they’re 65. You don’t know how many of them really believe that. Do not doubt me. That would cloud your thinking on a whole bunch of things. And then to get to the point of not even having kids because of it now! RUSH: Parsippany, New Jersey. Jeff, I’m glad you waited, sir. It’s great to have you. Hi. CALLER: Hello, Rush. How are you today? RUSH: I’m okay. A little scattered, disorganized here. I hope it doesn’t sound too bad, but we’re trying to maintain focus. RUSH: Thank you. See, he admitted it does sound disorganized today. I knew it. Well, when you got pages sticking together, you got too many pages. At any rate, I appreciate your patience. CALLER: That’s okay, Rush. Two things. I wanted to ask you who the two most prominent Democrats were not to come out and defend Chelsea Clinton over her anti-Semitism remarks. And while I was on hold, you went through the list of the top 20 things that stress out Millennials the most, and I expected climate change to be in like the top three. And it wasn’t on the list at all. Could it be that climate change is a manufactured crisis, Rush? RUSH: I think that’s a good bet. I think that’s probably totally true. By the way, this survey of Millennials was not taken by people that you would normally associate with the Drive-By Media. This survey is done, commissioned by DOKA CBD oil company. So you might say climate change isn’t on here because an oil company participated. I don’t know what CBD oil company (interruption) — I’m sorry. What was that? Oh, oh, CBD oil is medicinal marijuana. So it’s a weed poll! All right. Well, this helps put it in perspective. Look, hang on there, Jeff. Don’t hang up. We’ll be back to you here in just a second. RUSH: Back now to Jeff in Parsippany, New Jersey. So this survey “commissioned by CBD oil company Endoca, reveals that one-third of millennials believe their lives are more stressful than the average person’s life.” Your observation that climate change is not on the list is a good observation, ’cause this is obviously not a poll taken by a media-driven polling company, which might present multiple choice options, as many questions do. RUSH: Wait! Whoa, whoa, whoa, whoa. Who says that? RUSH: All right. All right. CALLER: — today than I do. RUSH: All right, Jeff. Hang on. It’s time for a little buck-up you here. You say you’re 60 and your opinion doesn’t count anymore? RUSH: All right. When you were 30, when you were the age of today’s Millennials, share with me your attitude. Did you think people 60 and 65 didn’t know diddly-squat, that you had all the answers, that you knew everything? CALLER: I gotta honest to you, Rush: 30 years ago, I was listening to you, and I was 30, and I got along really well with people much older than me. You know, my father’s generation. RUSH: Well, there’s a reason I ask. There’s a reason I ask. I’ll use myself in this equation for part of it. When I was Millennial aged, 30/35 — when I was 25 — I vowed that I was not gonna become an old fuddy-duddy when I was older. Not that I was gonna be forever young, but that I was going to always know what young people were up to and what they were hip to, and I was gonna try to stay current with the music they liked. My parents liked Big Band, World War II, Sinatra stuff when I was a kid. I thought that just — and they thought the Beatles were the ruination of society ’cause of the long hair. Now I’m 68, and I understand. Part of aging, when you get to be 60/65, and you consume… Remember, the media is put together by people 35 to 40, 45. So everything is gonna be about them, and if you watch it in an incorrect way, you can be led to believe that you no longer matter, that you’re no longer a factor. You’re old. Your days have come and gone and you’re now just playing out the string. Your ideas and your existence are no longer important to the future of America, that life is for the young. RUSH: You have to understand the reporting on these kids. The reporting on these Millennials — and we say “kids.” They’re 30 years old. But the reporting on the Millennials is they are nothing more than a football. You’ve got to think: In all of this, the media is the center of this leftist universe, not the Democrat Party. Maybe you call ’em co-centers, but the media is an activist bunch of leftists now. They’re not journalists. They’re not reporters. They are an activist political movement. Millennials and surveys of Millennials taken by the media are nothing more than efforts to create a mind-set in people like you that you’re now outnumbered, that you’re now overruled, and that you’re not hip, and that your time has come, and the center of the universe is these Millennials. That’s the reporting that you hear, and that’s the reporting… Because it’s done on purpose. Millennials have not changed. Thirty-year-olds still don’t know as much, on balance, as 60/65-year-olds, but they’re simply what they think supposedly — like climate change is an example, what they want. Look at how much of our cultural evolution today is based on what Millennials supposedly think: Political correctness, snowflakes on college campus, all of the cultural upheaval that Millennials supposedly support and demand. Whether en masse they do or not, they are proxies for the leftist agenda. So are illegal immigrants proxies for the leftist agenda and it is simply that the leftist agenda is personalized using Millennials and the young in a way to make it look like it’s cool and hip and is the embodiment of modern forward thinking. Everything that you see in the media is designed to the advance the leftist agenda, including dispiriting you and making you think that you’ve already lost in the battle to preserve America as founded, or the American culture. It’s designed to make you feel outnumbered. It’s designed to make you feel impotent and totally incapable of stopping this onslaught. It’s designed to make the onslaught look normal and really cool and really modern and really where it’s all at. It’s all a game, because not every Millennial thinks alike. Not every Millennial is of the same political persuasion, cultural belief. But yet they’re presented as a giant monolith, as women are presented as a giant monolith. You have to have a steel spine to resist all this, because it’s designed to make you deny what you know is true. It’s designed to make you not believe what you’ve grown up believing: The values, everything that you hold dear. This onslaught led by the media and all of their proxies is designed to make you feel like the biggest outsider you’ve ever felt like. That’s how they seek ultimately to win and overrun anybody by eliminating any opposition, ’cause if they can succeed in making you think it’s over, you’re not even gonna fight back! You’re just gonna seek someplace to live out the rest of your life, not make waves, not get noticed. That’s what it’s all designed to do. But it’s all in direct conflict with common sense. So don’t fall for it, and remember when you were 30 versus how you are today. You’re not an antique. You’re not outmoded or any of that, and the world doesn’t revolve around anyone. It’s what you make of it. RUSH: Here’s James in Peru, Indiana. Welcome, sir. Great to have you here. CALLER: Thank you, Rush. I truly feel honored that you took my call. Thank you. CALLER: I just wanted to say that as a Millennial that I don’t just think, but I know the American dream still exists despite the negative narrative of the mainstream media. And I can give two very clear examples that allow me to know so. RUSH: Okay. Go ahead. Give it a shot. RUSH: Let me tell, I do not know — your instincts are so on. You do not know the importance of what you just said. You were willing to pull up stakes and leave in order to realize whatever it is you want out of life. A lot of people — I’ve always believed that most of the limitations that people have are self-imposed, and one of them is an unwillingness to leave. And there’s nothing wrong with that. If you like where you were born and grew up, that’s fine. But your willingness to leave, meaning, I take it you’re gonna have to leave to find what you want because of the direction Colorado’s going, what you want, not what you want, so you’re gonna seek it elsewhere? RUSH: Well, it’s a bigger deal than even you know. You’re living it, you’re doing it, so it’s not that big a deal to you, but it is. Willing to pull up stakes, go someplace where maybe you don’t know anybody, but you know that what you want is there, is a very big deal. And it’s a correct, pretty good enunciation of the American dream, which is being ripped and sullied and distorted throughout American education. So it’s great to hear from you. I’m glad you called. I’m glad you had time to get through.